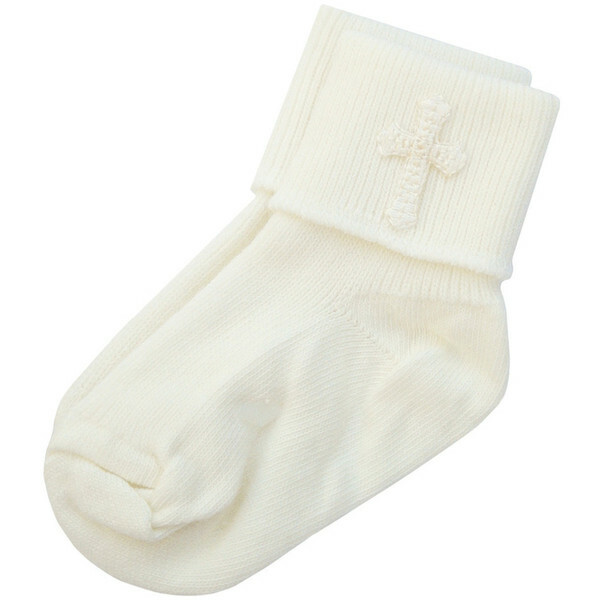 Beautiful baby boys ivory cross socks, perfect for your little boys christening / baptism day. These socks are plain ivory. They have a ribbed ankle with a beautiful embroidered cross. These socks are brand new with tags. They will beautifully finish off your little boys christening / baptism outfit / suit. Made in England UK by the Kinder Collection, guaranteed 100% excellent quality. Beautiful cream coloured socks looked perfect with my grandsons oufit good quality and speedy delivery. Very pleased with these boys christening socks. Soft and have good stretch. Cross detail is very nice. Socks arrived very quickly and they were gorgeous , adding the final touch to a beautiful Christening outfit. So pleased with the socks for my sons christening looked perfect with his outfit. Nice quality and arrived really quickly. Would recommended. Really lovely socks, good quality, completed the outfit also purchased from childrens special occasion wear! Very happy with socks, great fit, stayed on my baby on the day and have washed up no problem. Website easy to use & speedy delivery. A perfect sock for a very special day. I would like to express my sincere thanks for my order which I received today. The socks are delightful. Thank you.